When I first encountered Phil Foglio, he seemed to be everywhere in fandom: performing comedy with Moebius Theatre, co-publishing the fanzine Effen Essef, drawing a million cartoons for other fanzines, hanging hilarious plates (yes, I said plates) in convention art shows. Phil and Doug Rice shared an apartment at 7660 North Sheridan, not far from the lake. Every Thursday night, Chicago fans would swarm into somebody's apartment. Extremely often, it was Phil's. It was in Phil Foglio's bathroom that I first discovered this: Brewer's Dictionary of Phrase and Fable is the perfect bathroom book. You can read a little, or you can read many pages. It's always interesting. He also had a copy of Mrs. Byrne's Dictionary of Unusual, Obscure, and Preposterous Words in there. Phil loves books. Phil had art books, of course, and we loved to pull them down and look at them, but his place was also filled with science books, history books, science fiction, fantasy, and (it will not surprise you to learn) many volumes of prose by the great humorists. It was a fine collection then, and I suppose it has grown since. Meanwhile, he was launching a career. I saw him win the Hugo Award for Best Fan Artist in 1977. I saw him do it again in 1978. One cannot eat a Hugo, but soon Phil was drawing "What's New," a monthly comic strip for The Dragon, and providing artwork to the burgeoning gaming industry. Book covers, comics, and a novel followed. Phil took great delight in hosting poker games for writers, artists, and fellow oddballs. The stakes might have been small, but the banter was priceless. Some of the regulars were ferociously enthusiastic card players, and when their deal came, they would declare the game to be some complicated variation I never heard of — with twos and one-eyed jacks wild — with a name like "Cincinnati Five-Way" (perhaps I am confusing this with the chili at Steak'N'Shake). It was bewildering. One night, in self-defense, when the cards came to me, I created "Fibonacci" (five-card stud, but five cards in a Fibonacci series beat anything, and high Fibonacci beats a low Fibonacci). This drew groans from the Serious Players, but grins from the computer geeks at the table. I lost money nevertheless. Phil moved to New York for a few years. He returned to Chicago with a snake. He moved in with Jim Fuerstenburg. At some point, the snake escaped. He was probably somewhere in the building, but Phil and Jim were reluctant to knock on the doors of their neighbors and say, "We lost an eight-foot boa constrictor. Have you seen him?" So they kept quiet, hoping that the snake would show himself. And lo, it came to pass that the snake did return. Jim was alone in the apartment at the time. He coaxed the snake into a laundry basket and put a piece of plywood on top. When Phil came home, Jim announced triumphantly, "I found your snake!" "Really?" said Phil. "Where is he?" "In this basket," said Jim, leading Phil to the basket. Jim lifted the board to show Phil the snake. Later Phil told me, "For just about ten seconds, I really had him going..."
Eventually, we lost Phil to Seattle. I can't really regret that, though, because there he met Kaja. Who is truly wonderful. Elsewhere in this booklet, Alice Bentley will tell you about Kaja. Both Phil and Kaja contributed paintings to the popular card game Magic: The Gathering. Together, in spare moments over the years, they planned and (literally) plotted a grand series of comics. As the new millennium dawned, they unleashed Girl Genius upon an unsuspecting world. How good is it? This year the Foglios added another Hugo — the first ever for Best Graphic Story — to their collection. Girl Genius spinoffs include paper dolls, mugs, and radio plays. With Othar’s Twitter, Phil and Kaja may have invented a new literary form: the novel with 140-character chapters. They are raising two children, who believe it is completely normal for Mom and Dad to hang around the house all day long drawing comics. Phil serves as advisor to the Comics Club at school. The kids there draw their own comics. So if, at the beginning of the 22nd Century, art critics rhapsodize about the radical Seattle Movement that revolutionized comics, you'll know whom to thank. Now WindyCon has invited Phil and Kaja to return to the City of the Big Shoulders. I hope you get an opportunity to meet them this weekend. And if you visit my house, you'll find Brewer's Dictionary of Phrase and Fable in the bathroom. I have Phil Foglio to thank for that. Written for the Windycon XXXVI program book in 2009. 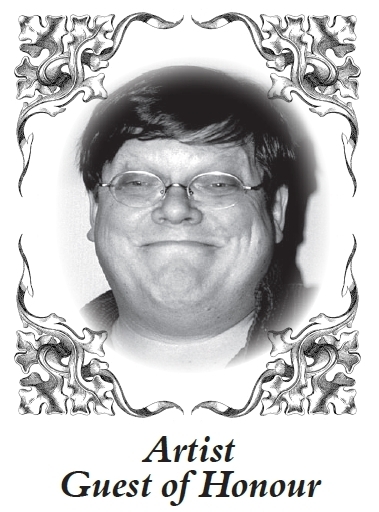 Kaja Foglio was also an Artist Guest of Honor; Bill accepted the task of writing Phil's bio, and Alice Bentley wrote one for Kaja. Later reprinted as part of Higgins's Lives of the Fans, a series of essays about science fiction fans he knows, posted to Bill Higgins' blog on Livejournal.